Looking back, the 2018 Supercross and Motocross season provided plenty of headlines and drama. Shoo-ins for titles fell short and while no punches were thrown some incidents helped advance the excitement and spectacle that comes with racing dirt bikes. Eli Tomac became the first rider since Ricky Carmichael to win back-to-back premier class titles. The feat also put Tomac as one of five to accomplish back-to-back Championships since 1982. It didn't come easy though as he lost a 32 point lead entering Redbud - the start of the second half of the season - and was down by three to Marvin Musquin with five rounds remaining. He quickly got the Red Plate back though and pushed on towards the finish line. 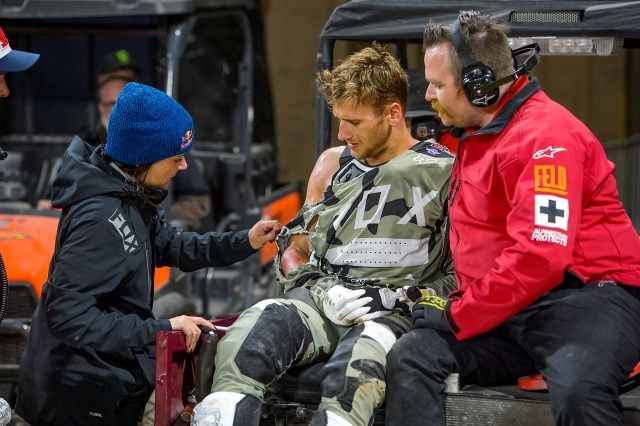 Ken Roczen triumphantly returned to racing after a devastating arm injury the year before and managed well despite riding with a left arm still not fully healed. But in Round 6 his emotions got the best of him and his throttle as a social media tiff with Cooper Webb sent Roczen into Cooper's rear wheel and busted up his right hand. He worked his way back from injury yet again, managed to make the opening round of Motocross, eventually got two Moto wins and finished third in points for the season. Thanks to early season woes with Eli Tomac and Marvin Musquin, both considered top contenders for the Supercross title, Jason Anderson jumped to an early lead and never relinquished despite hard fought efforts by Tomac and Musquin to fight their way back into contention, and a flat tire. 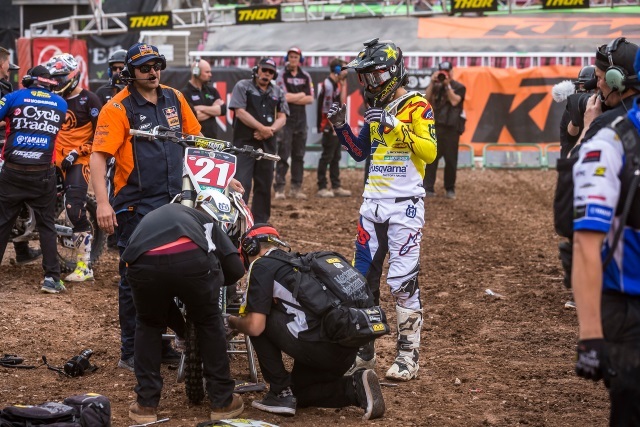 The flat tire felt around the Supercross world left Jason Anderson with ants in his pants as he waited in the pits for a tire change in the second to last round of the 2018 Supercross season. He just needed a fourth-place to clinch the title one round early in Salt Lake City, something he managed in 14 of the previous 15 rounds. His 34 point lead dropped to a queasy 14 points over Marvin Musquin for the final round. 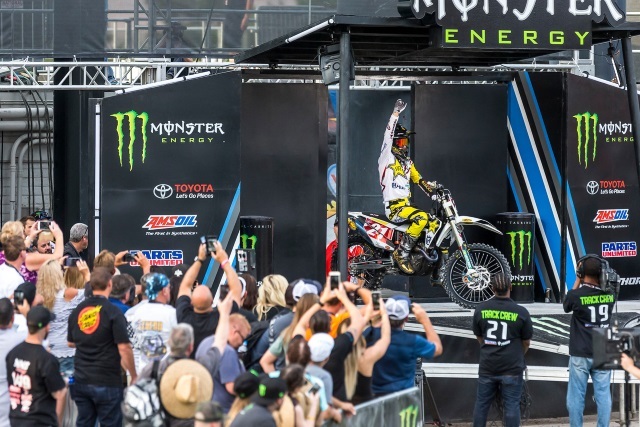 He recovered though and took an easy fifth-place ride in Las Vegas to clinch his first premier class title. Anderson won only four rounds but finished 14 times in the Top 4 to prove consistency wins Championships - he won by nine points over Musquin. In news that brought back memories of James Stewart, Broc Tickle tested positive for methylhexaneamine, a banned substance, and was provisionally suspended by the FIM (the Fèdèration Internationale de Motocyclisme - the global governing/sanctioning body of motorcycle racing) in April for the February test result taken after the San Diego Supercross round. Like Stewart in 2014, who failed to properly submit a Therapeutic Use Exemption for his use of Adderall, Tickle has received no word to date on the length of his suspension, leaving his career in limbo. In May, after a second test confirmed the original outcome, Red Bull KTM cut ties with Tickle, who had joined the team for 2018 and was also working with famed trainer Alton Baker. Stewart eventually received a 16 month ban (retroactive to the date of the failed test) and if Tickle, who is training on his own, receives a similar judgement, he won't be able to race until the end of Outdoors in August. In what was widely considered Team USA's race to lose, they indeed lost, not even reaching the podium at this year's Motocross of Nations held on home turf at RedBud. The team consisting of Eli Tomac, Justin Barcia and Aaron Plessinger finished sixth and had little for their European counterparts who rode the sandy and muddy course like one of their own. The rain didn't help nor did the sand brought in for drainage but mostly all excuses for a team that held the best chance to end a now seven year winless streak for the Americans in the Olympics of Motocross. 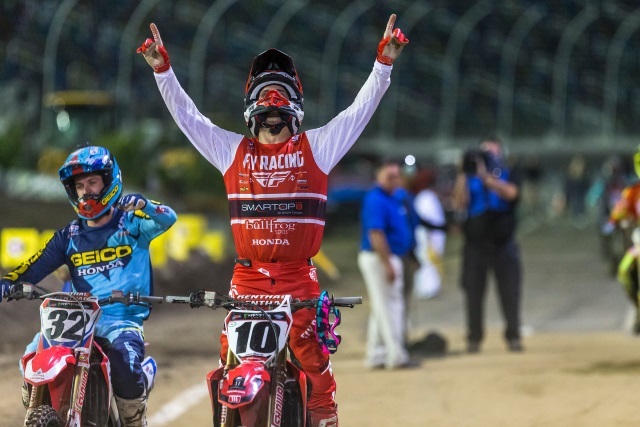 In one of the best feel-good moments in a long time, veteran Justin Brayton got his first career Supercross win at Daytona, just days before his 34th birthday becoming the oldest rider ever to win in the premier class. He led all but one lap and fended off a charging Eli Tomac who came from last place and finished second. 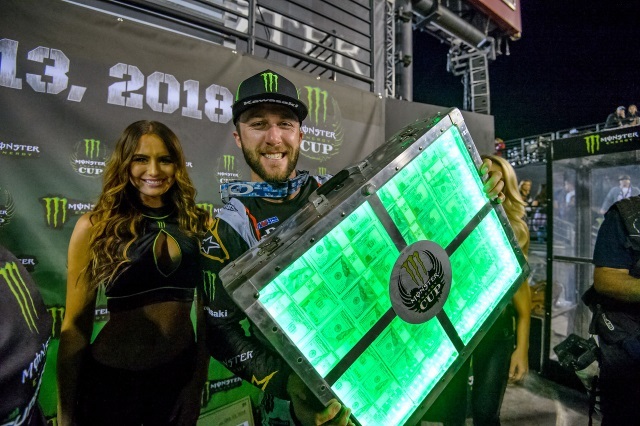 Eli Tomac became the third rider in eight years of the Monster Energy Cup to sweep and win the $1 million prize. He had some help as his new teammate Joey Savatgy ushered him on by in the third of three Motos to secure the victory and sweep. His win also cemented $1 million for a fan in the first-of-its-kind sweepstakes prize. 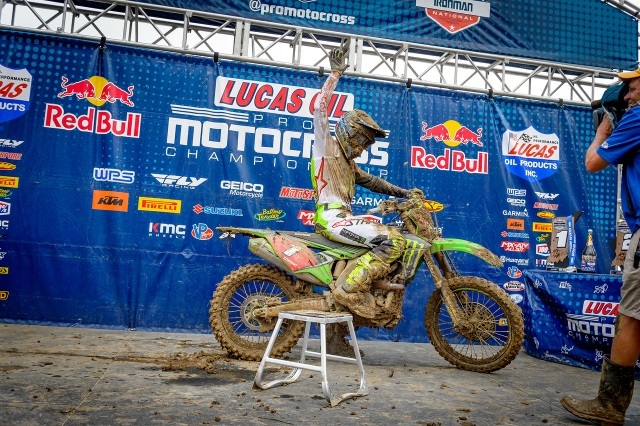 Tomac also became the second rider in a row to win the grand prize as Marvin Musquin won the year before. 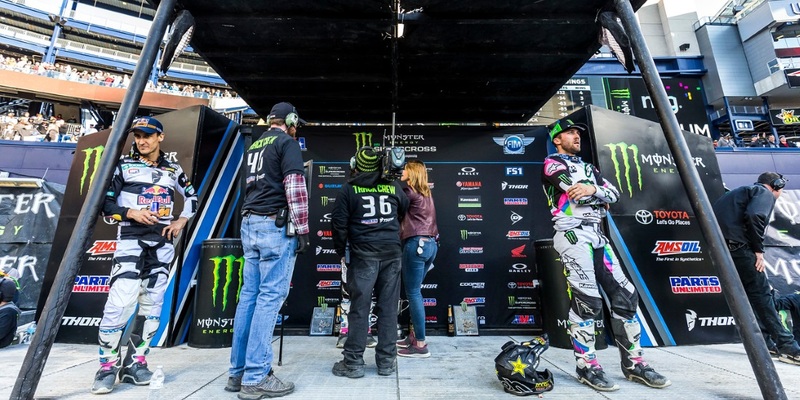 The Foxborough incident during Supercross involving Eli Tomac and Marvin Musquin wins out in the toss up with Tomac's bike malfunction and ensuing crashes at RedBud during the Motocross season which erased a 32 point lead and dropped him to second behind Musquin. Zach Osborne and Jeremy Martin, the two title contenders for the 250 class in Motocross, bowed out early because of injury opening the door for Aaron Plessinger who had little competition the rest of the way for his first 250 class Championship. Osborne was the defending Champion and Martin was looking for his third Championship but neither made it halfway through the season. Martin gets another shot for a 250 class title next year while Osborne and Plessinger both move to the 450 class. In an offseason race entered at the last minute after Marvin Musquin exited because of a practice injury, former MotoSport-sponsored rider, Weston Peick sustained frightful injuries at the Paris Supercross last month. 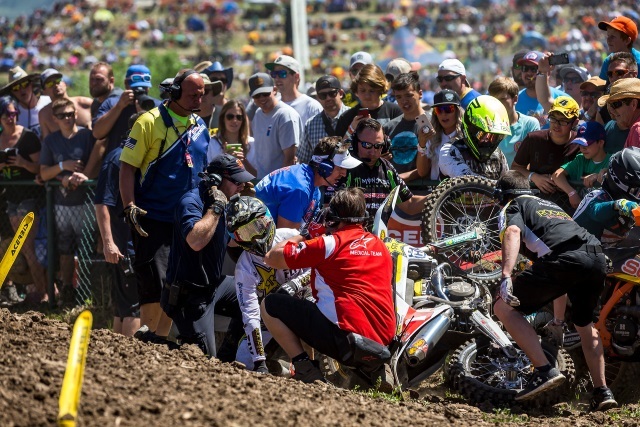 Peick collided with Dylan Ferrandis sending him to the ground then Cedric Soubeyras cased a jump on his head leaving Peick with multiple facial, mouth, nose and eye injuries that affect his vision. He was placed in an induced coma and required surgery to rebuild his jaw. Peick is home now, recovering but his racing future uncertain.